As it is highly unlikely that U.S. Congress members will see past their differences during the current term to pass the Jobs Bill and put people to work, I did some research to find out what types of jobs are available. Fortunately for those of you interested in making money online, the news is good! 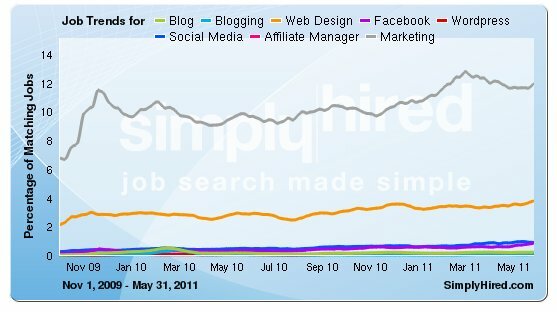 I did a job search at SimplyHired each of the terms I selected showed an increase between 77 and 722 percent since November of 2009. Hmmmm…. the 2 terms with the largest increase? Blog and WordPress. That alone should tell you that there are jobs out there for those with writing (blogging) and WordPress design skills. You got 'em – USE 'em to earn some coin. For some ideas on how to use your skills, please see my Make Money Helping Local Businesses Start a Blog article. If you don't know how to blog, learning has never been easier or less expensive than that available through my Academy (aka Affiliate Blogger PRO). We supply tutorials, videos and a community forum to help you learn everything you need to know about blogging and affiliate marketing. 1) Take money from you and me, the taxpayers, so the government can hire people for TEMPORARY jobs. There were stats on the last stimulus bill where these jobs ended up costing millions of dollars per job. Yes, I said per job. At that rate, it would be cheaper for the government to just hand the money to the people.. Oh wait!! They/we the taxpayers already do that with entitlement programs. 2) Allow the gov. even more money to hopelessly mismanage. >> Don’t even get me going on this one. 3) Put the U.S. into further debt and even more beholden to China. I’m sorry, but I was taught not to spend what I don’t have. Not only is the plan fully paid for but it decreases taxes for middle income families, so I’m not sure how you come up with points #1 and #3. In addition to the response provided to Jeff – the Act will preserve teachers’ and first responders jobs (full-time jobs) as well as expand access to broadband wireless, the latter of which enhances infrastucture which in turn creates incentive and investment. We should always arm ourselves with the facts before making statements that misinform. ” We should always arm ourselves with the facts before making statements that misinform.” right back at you..
We have a polar opposite value system, such as IF by chance there happens to be extra money laying around, I believe it should be spent paying down our debt to China.. NOT more spending. It’s just a difference in what we believe is right and wrong. If all I had was $100, I would use some of that to pay the interest owing on my credit card, but the majority would be used as an investment (PPC, autoresponder service) to earn more. This is such a positive article – you are just showing people where the growth is, and it is not in reviving old manufacturing or extinct industries. We should be moving forward and evolving towards these more flexible delivery jobs. Funny you posted this at a time when my friend Eric Charsky is working for a Aircraft Jobs site. They have tons of jobs available and no one to fill them. Seems this is an Airline industry wide problem. They tell me over there that there is a huge number of openings in the Aerospace industry due to so many mechanics still overseas or in the military. So if that is a job that any of you are qualified for, there are placement services dying to help you get a great job now. Bet there are more in many industries but we just don’t know about them. Why would you think passing Obama’s supposed “jobs bill” would create even one job? Fixing all those broken bridges and bumpy roads would open some jobs. So would the modernization of at least 35,000 public schools across the country. The $4,000 tax credit to employers for hiring long-term unemployed workers — AND expanding job opportunities for low-income youth and adults through a fund for successful approaches for subsidized employment, innovative training programs and summer/year-round jobs for youth. There’s also the payroll tax cut by 50% the first $5 million in wages. I would love to know the best places to look for jobs like this. Are their online sites with lists of jobs in this field? I’m asking for my son who is looking for a job – he has a degree in webdesign. He worked for a local retailer and managed their website and wrote the content for their blog for several years, and was laid off last week. Any suggestions would be greatly appreciated!